Happy May! Spring has finally arrived in the Upper Peninsula of Michigan and the snow is melting! With this snow melt comes fast flowing rivers and raging waterfalls. This high water tends to hide much of the rocky features at the falls (the part I like) so it isn’t my favorite time of year to photograph them. But what I do enjoy is seeing, hearing and feeling the power of Mother Nature and the transition of seasons. Below, I’ve come up with a few of my favorite waterfalls you should visit during the spring melt. While there are many other great ones to see, I thought I would share some of the popular ones as well as the lesser known. Have a favorite you like seeing in the spring? Please feel free to comment! Paradise, MI – If you want to witness and experience the spring melt up-close (a convenient viewing platform puts you right at the crest), then Michigan’s most popular waterfall is for you! With the river being 200 feet wide and the drop being over 40 feet high, you can bet there’s going to be a lot of water flowing over the falls during the snow melt. With an annual average flow rate of 7,000 gallons per second, it is said the river can peak upwards to 50,000 gallons per second! That is a lot of water! 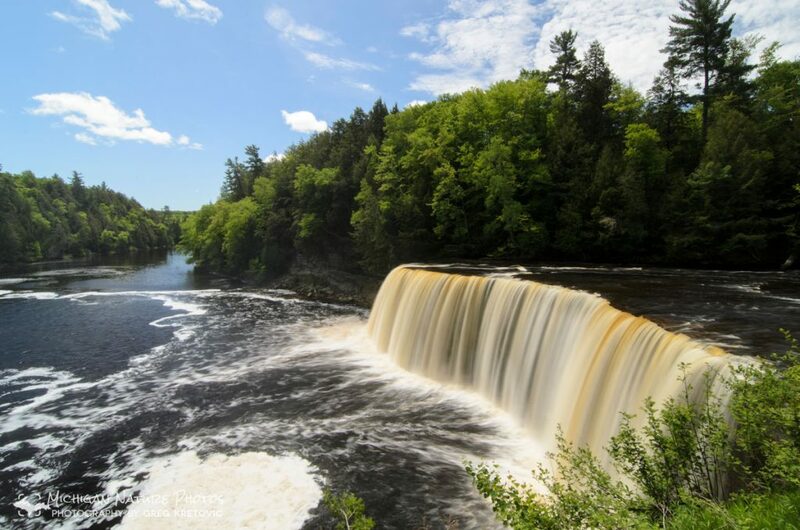 Upper Tahquamenon Falls seen on a summer day. Now imagine 50,000 gal./sec. flowing during the spring melt! 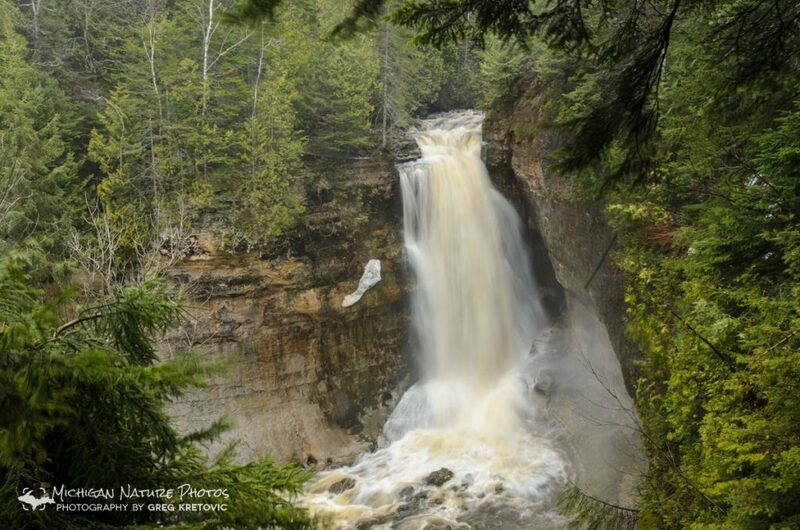 Munising, MI – Located within the Pictured Rocks National Lakeshore, this nearly 40-foot falls drops into a narrow, sandstone gorge which generates a thunderous sound, wind and mist. A lower platform, reached by stairs, places you right in the middle of the wind and mist created by the waterfalls. Although it can be challenging to keep your camera lens dry, it is well worth the experience. Norway, MI – On the border of Michigan and Wisconsin, the Menominee River becomes very rugged and narrow in this stretch near the town of Norway as it flows through a gorge with 4 different piers (rapids). The draw here isn’t so much the waterfall (Misicot Falls is pier #3) but this is the closest thing to whitewater rapids you’ll see in the Midwest. During the spring season, the river becomes especially powerful and draws world-class paddlers to kayak and raft the river. A convenient trail along the river’s edge provides some great viewing perspective. Also, there are a couple of rafting outfitters in the area if you want to give it a try yourself! 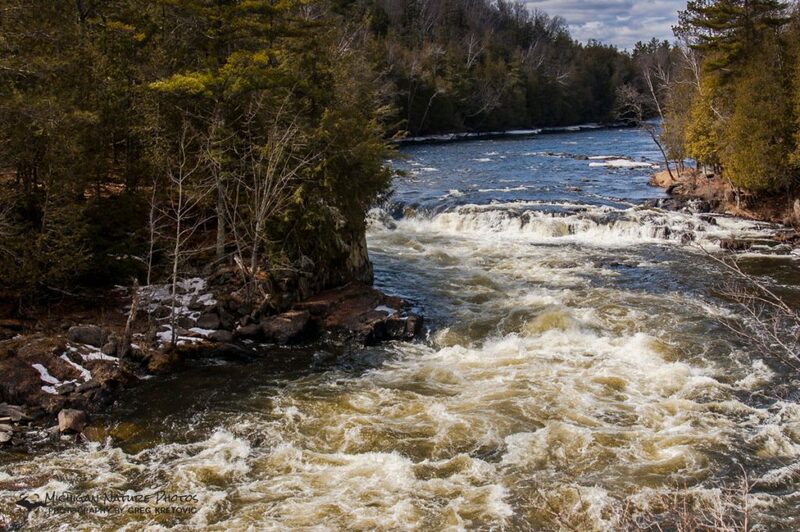 Sidnaw, MI – The Sturgeon River is another big, wide river that really gets churning during the spring melt. 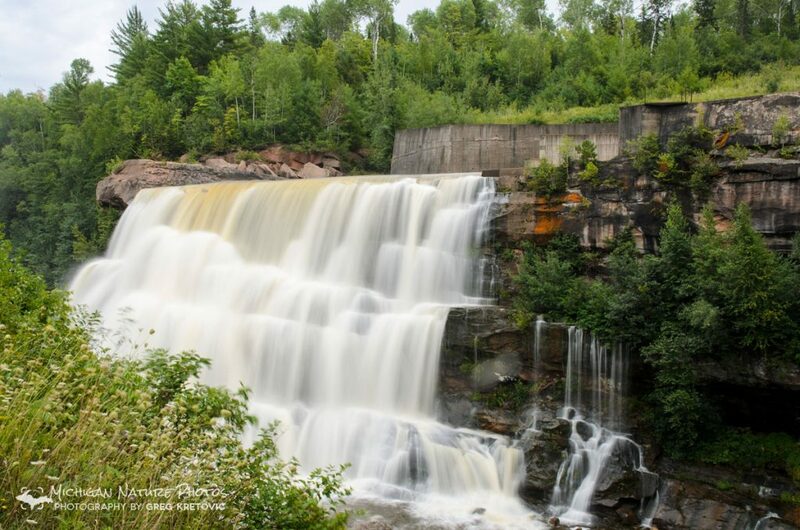 Although the popular Canyon Falls (along U.S. 41 south of L’Anse) is a great spot, the lesser known Sturgeon Falls is another great destination to witness the raw power. 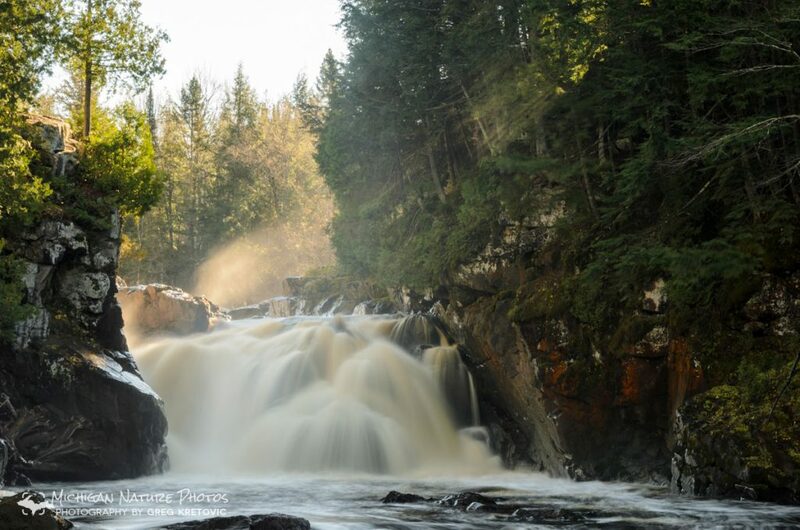 The falls is located down within the Sturgeon River Gorge Wilderness Michigan’s deepest gorge (300+ ft. deep and a mile wide). What makes this one unique is that the 100-foot wide river is compressed through a 25-foot wide rock outcropping at the falls. Now imagine a fast-flowing river passing through this! Rockland, MI – As the name implies, this isn’t your typical natural, free-flowing waterfall. Located on the West Branch Ontonagon River, this large concrete dam structure is a unique sight to behold. Located in Big Snow Country, the radial arm floodgates are opened to allow the excessive water to flow downstream from the reservoir. The amount of wind and spray generated by the rushing water is awesome! Thanks for reading! 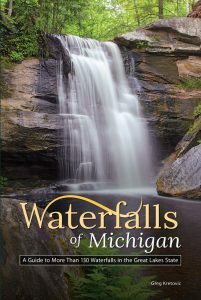 If you’d like the full details on these falls and the many others around Michigan, then make sure to get my new MI waterfalls guide book.